They’re back, pistols reloaded, in all their smudged and deadpan glory! Pete, aggressively passive and always ready to embrace a new fanaticism. Shirley, his beloved wife, except when she’s trying to poison him. Steve, his best friend, except when he’s shooting him. Loretta, his best stalker. And Steve’s Dad, who is very wrinkly and owns many grenades. 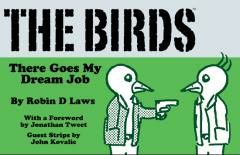 There Goes My Dream Job takes the feathered anti-heroes of Robin D. Laws’ webcomic through their second print collection of life, love, mordancy and irresponsible handgun use. With guest strips by John Kovalic (Munchkin) and a foreword by Jonathan Tweet.